A very sweet friend Em pointed out that we should be sharing with the world some of the fantastic stores that carry our stuff. It's something that gives us much joy, that is to see what we poduce in the windows and on the shelves of some of the coolest retail experiences around so we are now going to make an effort to visit all the places we can and show you how they show off for us. First off the mark is Evolve Homewares, this one is in Cottesloe Western Australia but they are also in Shenton Park and West Perth. 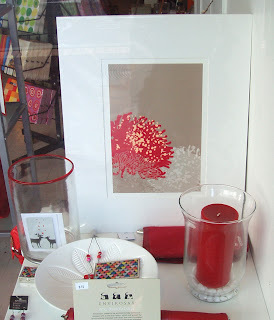 They stock a range of Prints as you can see in the window and cards. Thank you to Robi Smith who kindly took this photo after I took my camera out and forgot to put in the flash card duuh! The print featured here is the Taupe and red Native from the Native Naiive series. 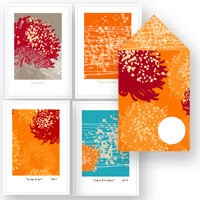 This is one of the first and most popular designs we produced that is an abstraction of Australian Native flora. 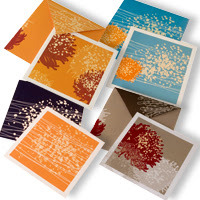 There are four designs in this series that come as greeting cards, prints and mini Limited Edition Prints in a funky Envelope. The last item actually won us the Austalian Memento Award for Memento of Western Australia, pretty cool if I do say so myself.